Serve Goes well with: 12°-14°C. A great companion for classic aperitivs and main dishes based on fish or white meat. "Doctorwine" has rated the wine "Elena Walch Castel Ringberg Pinot Grigio Alto Adige, Trentino-Alto Adige, Italy" from the vintage 2012 on 13.11.2013 with 91 of 100 points.
" Another 100% Pinot Grigio but this time from Alto Adige and made by a producer who has played a major role in the regionâ€™s quality revolution. She owns two estates: Castel Ringberg, overlooking Lake Caldaro; and Kastelaz, above the town of Termeno, the â€˜homelandâ€™ of the famous aromatic grape Gewurztraminer. The Pinot Grigio is from the first estate and the grapes are from a hot year, even if this is rarely a problem in Alto Adige. The wine has a full color and an intense and complex aroma where typical fruity scents are perfectly amalgamated with notes that derive from the partial fermentation in wood. The immediate impact of the mouthfeel has a lovely freshness and finessse before it evolves profoundly accompanied by a constant minerality. " 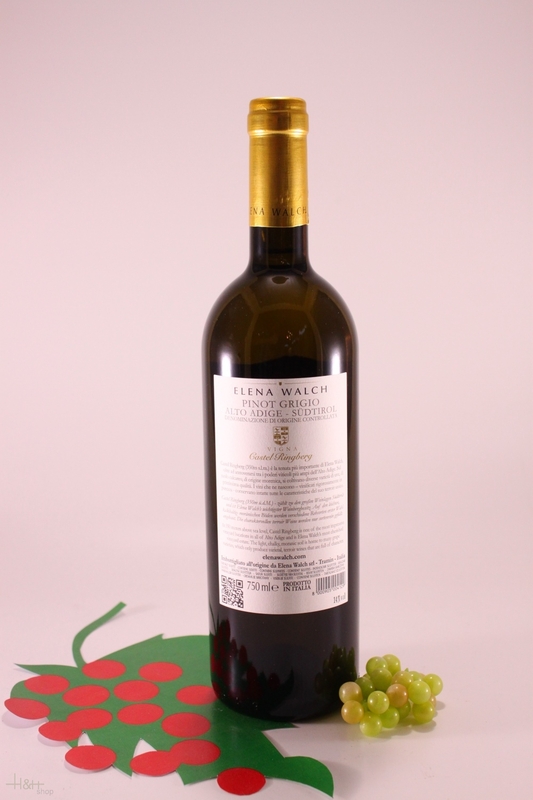 "Gilbert & Gaillard" has rated the wine "Elena Walch Castel Ringberg Pinot Grigio Alto Adige, Trentino-Alto Adige, Italy" from the vintage 2011 on 06.07.2012 with 90 of 100 points.
" Brilliant gold. Mineral nose opening up to dried grasses and aniseed. Full, rich and fresh palate showing a seductive mineral character and sourness. Abundant volume and length on a slightly tannic finish. Drink with fish. " "Wine Enthusiast" has rated the wine "Elena Walch Castel Ringberg Pinot Grigio Alto Adige, Trentino-Alto Adige, Italy" from the vintage 2015 on 07.01.2016 with 91 of 100 points. "Falstaff Magazin" has rated the wine "Elena Walch Castel Ringberg Pinot Grigio Alto Adige, Trentino-Alto Adige, Italy" from the vintage 2014 on 23.06.2015 with 89 of 100 points. "Vinous Antonio Galloni" has rated the wine "Elena Walch Castel Ringberg Pinot Grigio Alto Adige, Trentino-Alto Adige, Italy" from the vintage 2013 on 01.05.2015 with 89 of 100 points. "Wine Enthusiast" has rated the wine "Elena Walch Castel Ringberg Pinot Grigio Alto Adige, Trentino-Alto Adige, Italy" from the vintage 2013 on 06.01.2015 with 90 of 100 points. "Falstaff Magazin" has rated the wine "Elena Walch Castel Ringberg Pinot Grigio Alto Adige, Trentino-Alto Adige, Italy" from the vintage 2013 on 24.06.2014 with 89 of 100 points. "Vinous Antonio Galloni" has rated the wine "Elena Walch Castel Ringberg Pinot Grigio Alto Adige, Trentino-Alto Adige, Italy" from the vintage 2012 on 01.03.2014 with 89 of 100 points. "Wine Enthusiast" has rated the wine "Elena Walch Castel Ringberg Pinot Grigio Alto Adige, Trentino-Alto Adige, Italy" from the vintage 2012 on 06.01.2014 with 89 of 100 points. "Vinous Antonio Galloni" has rated the wine "Elena Walch Castel Ringberg Pinot Grigio Alto Adige, Trentino-Alto Adige, Italy" from the vintage 2011 on 01.05.2013 with 87 of 100 points. "Wine Enthusiast" has rated the wine "Elena Walch Castel Ringberg Pinot Grigio Alto Adige, Trentino-Alto Adige, Italy" from the vintage 2010 on 03.01.2012 with 90 of 100 points. "Wine Enthusiast" has rated the wine "Elena Walch Castel Ringberg Pinot Grigio Alto Adige, Trentino-Alto Adige, Italy" from the vintage 2009 on 11.01.2010 with 88 of 100 points. "Wine Spectator" has rated the wine "Elena Walch Castel Ringberg Pinot Grigio Alto Adige, Trentino-Alto Adige, Italy" from the vintage 2007 on 31.08.2008 with 87 of 100 points. "Wine Spectator" has rated the wine "Elena Walch Castel Ringberg Pinot Grigio Alto Adige, Trentino-Alto Adige, Italy" from the vintage 2006 on 30.04.2008 with 88 of 100 points. "Wine Enthusiast" has rated the wine "Elena Walch Castel Ringberg Pinot Grigio Alto Adige, Trentino-Alto Adige, Italy" from the vintage 2005 on 12.01.2007 with 90 of 100 points. "Wine Spectator" has rated the wine "Elena Walch Castel Ringberg Pinot Grigio Alto Adige, Trentino-Alto Adige, Italy" from the vintage 2005 on 15.11.2006 with 87 of 100 points. "Wine Enthusiast" has rated the wine "Elena Walch Castel Ringberg Pinot Grigio Alto Adige, Trentino-Alto Adige, Italy" from the vintage 2004 on 02.01.2006 with 87 of 100 points. "Wine Spectator" has rated the wine "Elena Walch Castel Ringberg Pinot Grigio Alto Adige, Trentino-Alto Adige, Italy" from the vintage 2004 on 15.11.2005 with 90 of 100 points. "Wine & Spirits Magazine" has rated the wine "Elena Walch Castel Ringberg Pinot Grigio Alto Adige, Trentino-Alto Adige, Italy" from the vintage 2001 on 01.04.2003 with 86 of 100 points. "Wine Spectator" has rated the wine "Elena Walch Castel Ringberg Pinot Grigio Alto Adige, Trentino-Alto Adige, Italy" from the vintage 2001 on 28.02.2003 with 87 of 100 points. "Wine Enthusiast" has rated the wine "Elena Walch Castel Ringberg Pinot Grigio Alto Adige, Trentino-Alto Adige, Italy" from the vintage 2002 on 07.01.2003 with 86 of 100 points. "Wine Spectator" has rated the wine "Elena Walch Castel Ringberg Pinot Grigio Alto Adige, Trentino-Alto Adige, Italy" from the vintage 2000 on 30.06.2002 with 88 of 100 points. "Wine Enthusiast" has rated the wine "Elena Walch Castel Ringberg Pinot Grigio Alto Adige, Trentino-Alto Adige, Italy" from the vintage 1998 on 08.01.1999 with 87 of 100 points.